Happy April everyone! This month I’m really excited to offer 2 giveaways! YES 2 and some extra love also. A Giveaway to Create Your Dream Life! Do you wish you had a roadmap to show you the way to your dream life? 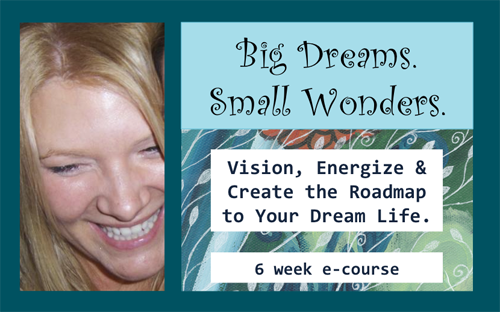 I’m pleased to be giving away TWO spots on my Spring Session of Big Dreams, Small Wonders which will take you on a journey to accelerate yourself to success Doing What You Love to Do. I will choose the lucky winners randomly on Tuesday and class starts on Monday April 11th! Visit Big Dreams, Small Wonders to find out more and Good Luck! I would open a BIG space where there could be creative classes taught for a donation fee, a big gallery space for the artists to show their work, free art classes for support groups, kids, homeless ect! I would resign from my job and be creative. I would travel around the world and encourage missionaries that serve so selflessly. If I could do anything – I would retire at the end of this school year (I am eligivle to) and get involved in teaching kids art! What a great giveaway! I need to dream big! and i would do it WITHOUT ANY FEAR OR CONCERN OF JUDGMENT! I would like to find the confidence and courage to start running some art workshops locally. People keep asking me but I shy away because I feel so much like a little fledgling artist! And then I would love a little community 'gallery' to showcase it all. Oooh and I would like to continue pursuing my creative spirit and not feel so guilty about not working full time anymore! Oh dear that was three! I dedicate to paint and travel!! I would lead ongoing art therapy groups and workshops and be a mum. Dream 2: make art and travel to all the continents and many places in between. Bring the healing powers of art making to children across the world. I would open a vegetarian cafe with a small little area to display hand made crafts. I would work to let the light out and not worry about what I should be doing (busy work) – and find the mental, physical and spiritual path to a balanced life. I would open a shop (selling handmade/made in the USA kind of stuff) and a photography/craft studio. My first focus would be Mothers – giving them a place to be and to learn new things.